Every once in a while, we get to read books that would change how we see life. 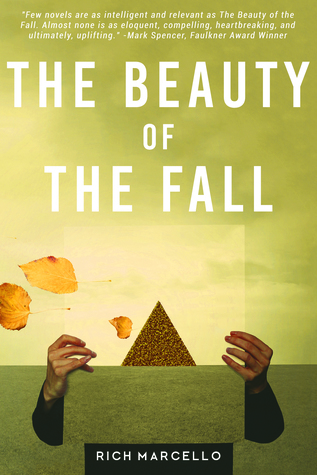 Rich Marcello brought such change in his literary fiction novel, The Beauty of the Fall. It explores ponderous issues such as overcoming grief, gender-based violence, and fighting one’s demons. The book introduces us to the life of Daniel Underlight. After his divorce and his only son’s death (which he blamed himself for), he threw himself to work. He was in grief and he depended on his job to erase the pain. When his friend and RadioRadio co-founder, Olivia Whitmore, fired him, he thought his life was over. The only one he had to rely on was Willow. She was a poet, a women’s rights campaigner, and Dan’s closest friend. With her help, Dan found meaning in life again. He decided to visit the headquarters of the Fortune 500 companies across America. His visits and experiences helped him shape his start-up idea. Dan recruited three former associates and started ConversationWorks. The company enabled real-time conversations of people in a virtual conference room. People could talk about solving substantial problems in the world. In a way, the company helped foster social change on a global scale. ConversationWorks, or CW, garnered initial successes after its launch. Yet, it also attracted enemies, with Olivia in the lead. The Beauty of the Fall was an insightful and intellectual read. Dan’s team often talked about the possible benefits and drawbacks of their actions. Additionally, the poems in the book were heart-warming. Willow was a poet and she was the source of most of the poems in the book. Dan used those poems as inspiration and guidance when making critical decisions. The author put together an awesome set of characters. Maggie, Charles, Zia, and Willow were the perfect set of friends for someone like Dan. They had varied perspectives when it comes to deciding what’s best for CW. They argue and voice out their concerns. In the end, they based their final decisions on the code of conduct that Dan made for the company. Plus, they never forget to listen to their employees. They were busy executives, but they care about their employees and consumers. They’re not difficult to love at all. There are also profound lessons that readers could glean from the book. Anything I say here might spoil it for the readers. Instead, I will share my favorite line in the book: “Everything is emerging exactly as it needs to.” While Dan did not understand this at first, he learned what it meant as the story progressed. I thoroughly enjoyed reading The Beauty of the Fall. There were no grammatical or typographical errors so it did not disrupt my reading. There was moderation in the flow of the story: there were time skips, but it was minimal. Be warned though that some form of self-harming is present in the book. It was not graphic, but some readers may find it a bit disturbing. With all these things in consideration, I give The Beauty of the Fall 4 out of 4 stars. This is for readers who love an intellectual read with profound life lessons and a host of inspiring characters. Like ellieonline03’s review? Post a comment saying so! Or you can read below. From the very first paragraph, Rich Marcello drew me into his book with a command of the language that I liken to a poet’s. Passages like this one, “He put his head down, tried to rekindle the wildfire he helped birth years ago, tried to daydream down a riven path.” and this one, “Don’t look down, the pinpricks have spouted and are covering the new carpet in blood.” provided me with ample proof early on that Marcello was a real deal literary composer, a master of the language, and a wordsmith with soulful depths. But beautiful language alone can’t make a reader keep reading. Original characters with powerful character arcs and a compelling story to keep all the characters growing is fundamental. No problem there, either. From Dan to his counselor to Willow to his son, stronger characterization is front and center. I know Dan–he reminds me of the author Richard Bach. I know Willow, too, this wild child, compassionate, changer of the world woman who is always strong, always courageous even when her heart is broken. These characters kept me reading. Then we arrive at the story. Characters and language need movement, need story, setting, pace, tension. Marcello has these covered, too. Set in New England, the vivid colors of the seasons remain clear in my brain long after I finished the book. Authors who take the time to divide their books into parts and give them names always receive a grateful nod from me. I like to know the structure of a story before I begin reading, and I like rolling back to the Table of Contents to remind myself what’s next in this journey. The Beauty of the Fall’s Table of Contents is especially brilliant; titles like “So it Spins,” “Build from the Sky Down,” “Spectacles, and Halos and Code” promised each chapter would carry its own mini-story and all the mini-stories would merge to form a powerful narrative. The Suits are black, genderless, and fill the elevator. As they slowly unload, walk toward my office, they scan everything– the flash-frozen employees watching their entrance, the desks filled with proprietary info, the cappuccino maker that would never make its way into one of their government offices. Maggie, who is standing next to me, who I insisted attend this meeting despite her strong objections, turns ashen, and a fidget subjugates her hand. In an Oyster Shell – This was an emotionally raw, well-poised, literary fiction that was unique with a fullness that is richly fulfilling. The Pearls –The narrative was raw, poignant and provocative. This was a primarily character-driven story. With well-developed characters, that worked in favor to the story. Rich Marcello, author of “The Beauty of The Fall” shares a bit about himself and his work. Rich Marcello, author of “The Beauty of the Fall”, has invited you to get to know him a little bit better. Find out a bit about him as he answers just a few questions, and make sure to follow him on social media! I love the work of Milan Kundera, Don Delillo, Alice Walker, Gabriel Garcia Marquez, and Adam Haslett, to name a few. Dan Underlight, in The Beauty of the Fall, is my favorite because he’s so complex. As a writer, I’m trying to go deeper and deeper into the soul of each of my characters, and so I focus a lot of my effort on their inner lives. In TBOTF, I spent most of my time on Dan. I wrote him over and over until I understood his grief at some deep non-verbal level. That’s when he came into focus. When I started writing, it was more difficult for me to write female characters well, especially when the scene was from their POV. But I’ve spent a lot of time working to improve my craft in that area, and now, I’m really proud of the female characters in my novels. I’m particularly fond of Willow in TBOTF and Paige Plant in The Big Wide Calm. The most rewarding part of being an author is when a reader writes me or tells me that one of my novels or characters resonated in some way that made a positive difference in her life. My hope is that my novels, in some small way, connect folks more to themselves and the world, and so, when it happens, it truly is rewarding. To write your first draft of each scene quickly so you fully capture the intended emotion. After that, edit over and over again until the scene is fully realized. In my fiction class, I like to tell students to rewrite a scene five times before they workshop it. That seems to work pretty well. I write seven days a week first thing in the morning for about five hours. I’m a big believer in going from one kind of dream time ( sleeping) to another ( writing fiction). I seem to do my best work this way. I’ve been writing all of my adult life, but only full-time for the last six years. In college, I had a chance to be mentored by a novelist in residence, but I was broke and needed to make money for a time. So when I graduated, I did. Throughout those years, I kept writing––mostly songs and poetry––but I always knew I would come back to writing novels. Hopefully, I’ll get ten or so of them out into the world before I’m done. I’ll pick two. I’d love to talk with John Lennon about music and the current state of the world, and I’d like to talk with Dalai Lama about love and kindness. Ride the tiger. That’s what we used to call working for a technology startup. It was a little like a gambling addiction. Objectively we knew the odds were against us. But we weren’t objective. We gave up sleep and personal lives (and occasionally basic hygiene) to stay on that tiger’s back. Our employee number—who was hired first, who had the best stock options, the most first-name access to the c’founders—was mentally tattooed across our brain, and haunted our dreams of the holy grail, the IPO. I know, I know… and I have the (worthless) stock options to prove it. I know other serial-startup veterans who have papered their bathrooms with their old options. But like any gambler, we also knew the next Next Thing could be the one. And now and then, it even worked. Sort of. I never became a software millionaire, not even close. But I did get the occasional nice payout that bought a car or kitchen remodel. Read more on the website…..